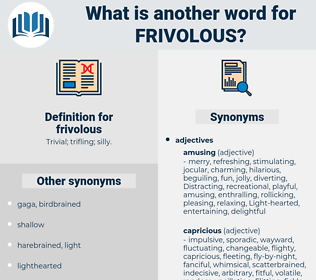 What is another word for frivolous? reckless, meaningless, unfounded, irresponsible, abusive, pointless, baseless, useless, insignificant, unreasonable, arbitrary, senseless, silly, hasty, improper, irrelevant, casual, exploitative, malicious, boring, inappropriate, shallow. futile, superficial, vexatious, trivial, ill-founded, unsubstantiated, imprudent, groundless, fanciful, rash, unfair. sensible, intelligent, thoughtful, wise, solemn, mature, grave. momentous, key, overmastering, prominent, substantial, eventful, fundamental, illustrious, notorious, fateful, heavy, preeminent, overriding, remarkable, prestigious, valuable, chief, impressive, great, worthwhile, renowned, somber, outstanding, basic, famous, meaningful, overbearing, major, dominant, principal, exceptional, significant, fatal, worthy, eminent, consequential, distinctive, essential, big, all-important, important, decisive. She had a small reception that evening and was the most brilliant, as she was the most frivolous, among her brilliant and frivolous guests. 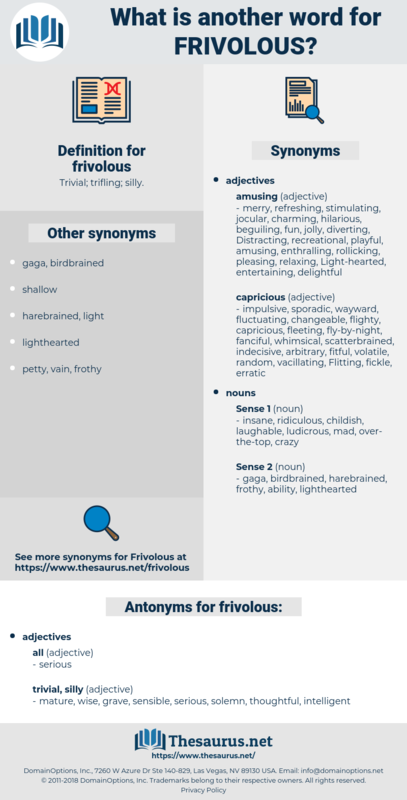 By temperament they are light - hearted, joyous, frivolous, and charming to deal with.